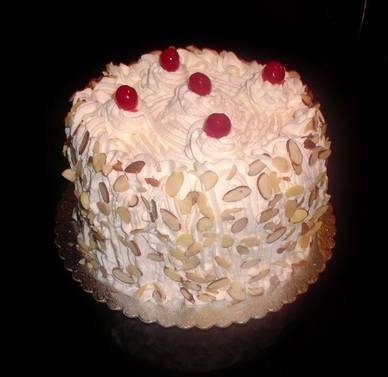 Almond Cream Cake - A 3-layer Italian Vanilla Sponge Cake that is filled with Almond buttercream between each layer. 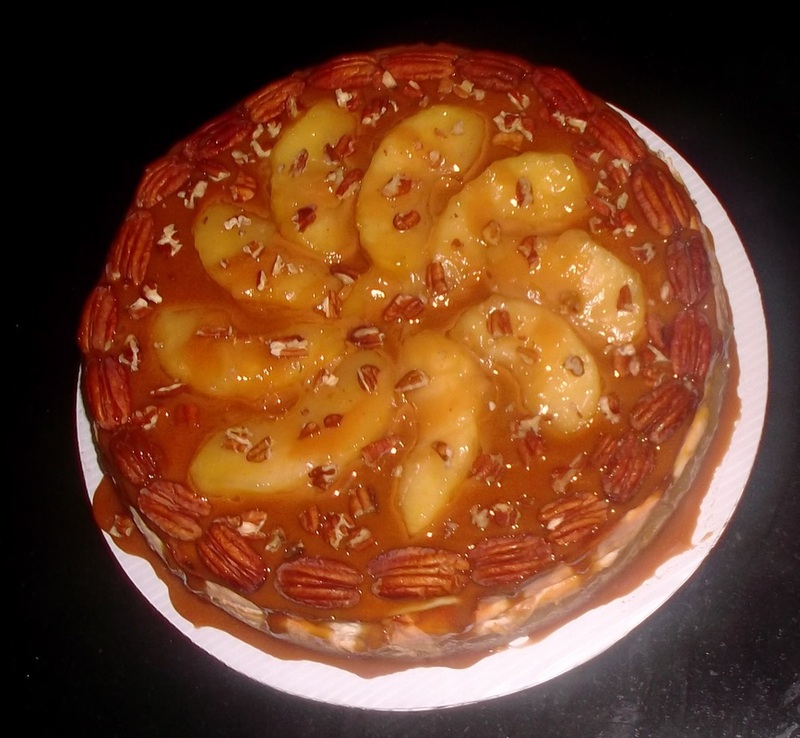 Garnished with Almond slices as shown. 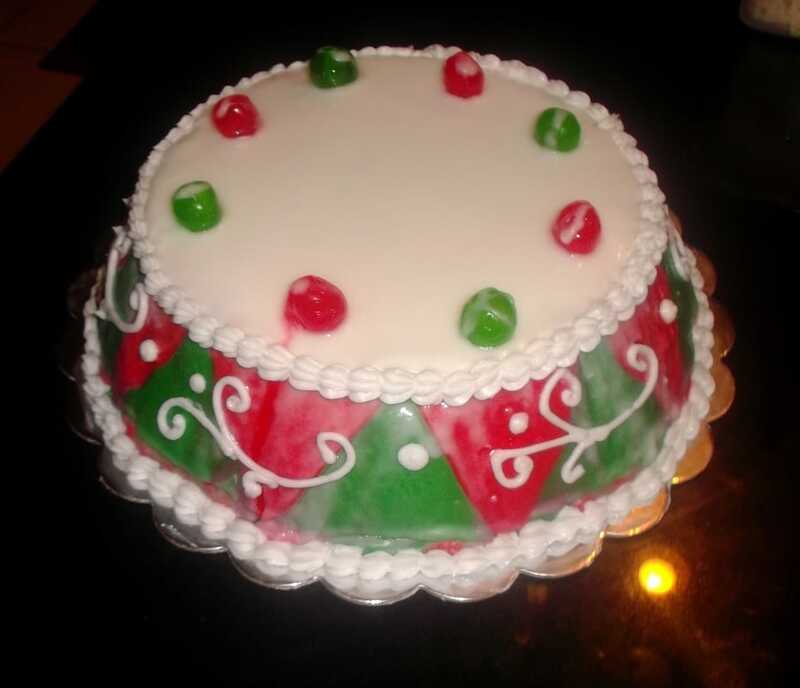 9" Cassata Siciliana - Traditional Cassata that is somewhat of a lighter Italian Sponge cake made using a 10” mold. Cake slices are brushed with Marsala and then filled with ricotta cannoli cream, which includes citron and chocolate chips. It is then iced with a thin layer of lemon butter cream and Italian lemon fondant. Glazed with a lemon glaze on top of that. 8" 3-tier Italian Rum Wedding Cream Cake - $40.00 - A heavier cake with 5 thin layers of rum-soaked cake. In between each layer is rum-flavored Italian pastry cream. The cake is then "iced" with a whipped cream icing and has almond slices pressed into the cream on the sides and adorned with maraschino cherries on top. Looks Like the NY/PA Bakery Rum Cake: I also make this cake, which is a 3-layer Italian Sponge Cake that is brushed with Rum and filled with both vanilla and chocolate cream (which are also flavored with rum). 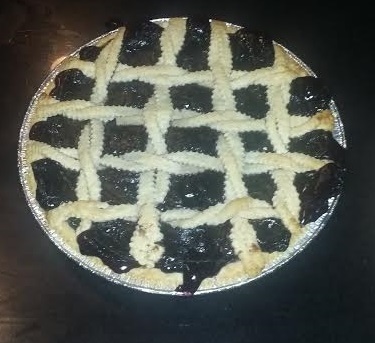 Can be iced with whipped cream frosting or whipped Butter cream. 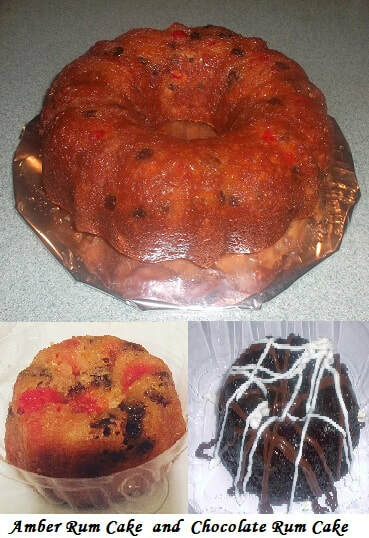 Full or 4 mini Bundt Cakes - Your choice of either Amber Rum Cake (Delicious sponge with rum-soaked raisins and cherries, drenched in an apricot-rum glaze) or Chocolate Rum Cake that is drizzled with both milk and white chocolate ganache. 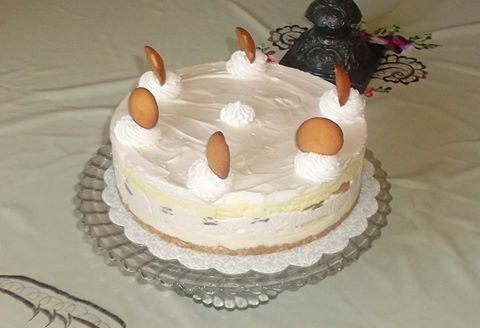 9" Banana Cream Icebox Cake - $35 This cake starts with a Nilla Wafer & Graham crust, then is topped with a layer of banana cream, a layer of vanilla cream, vanilla wafers, bananas, and then another layer of banana cream, and vanilla cream. You can't go wrong with this one! Carrot-Pineapple Cake - $25.00 - Not your typical Carrot Cake as Annabelle's is filled with Carrots, crushed Pineapple, and Raisins. Cream cheese iced and garnished on the sides with crushed walnuts. Cookies and Cream Chocolate Cake - $30.00 - 3-layers of Fudgy Chocolate Cake that are filled with "Oreo" cream. 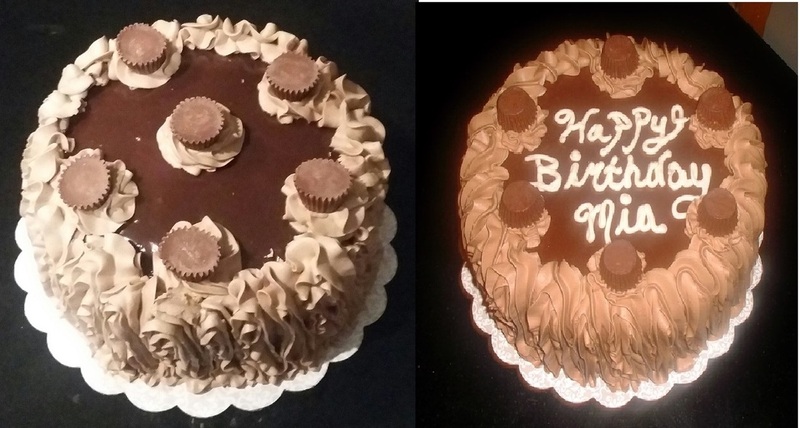 Topped with chocolate ganache and iced with chocolate buttercream. Adorned with Oreos around the top. Cookies & Cream Cake - $30.00 - 8" Cake that has 3 thin layers of chocolate cake with a thick cookies and cream filling between each layer. Topped with a dripping chocolate ganache, whipped buttercream, and chopped Oreos. Strawberry Shortcake - $35 8" 2-layer Vanilla Sponge Cake, filled with a thin layer of strawberry filling, sliced Strawberries, and Whipped Cream. Tiramisu Cake - $45 - A 9" Cake that is wrapped with ladyfingers, making it a 10" Cake. This cake has three layer's of Italian coffee and rum flavored sponge cake that are filled with a creamy mascarpone cheese filling that provides a hint of Grand Marnier. The cake and lady fingers are brushed with espresso. Iced with a coffee flavored whipped cream and adorned with chocolate slices. 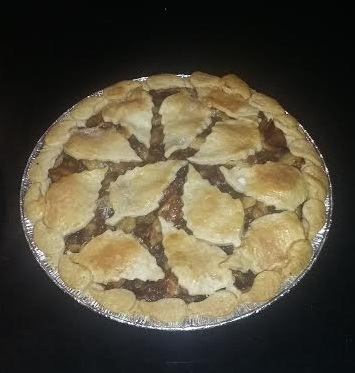 Dutch Apple Crumb Pie - $14. This pie has a delicious crumb crust and cinnamon-crumb topping. Banana Coconut Cream Pie - $12. A deliciously creamy pie that is filled with banana slices in a banana-coconut custard and then topped with toasted coconut and whipped cream. This pie is made with a graham-cracker cookie crust, unless otherwise requested. Banana Cream Pie - $10 - Annabelle's Banana Cream Pie starts with a wafer cookie crust that is lightly brushed with chocolate and then filled with banana-vanilla custard and slices of banana and then is topped with stabilized whipped cream! This 9" pie has a buttery crust and vanilla-crumb topping and is filled with juicy cherries.